﻿﻿﻿ Al Grunwald led two baseball lives. First, anyone spotting his nickname should be clued in that this was no ordinary pitcher. Grunwald was one of baseball’s good sports. Imagine being in an organization seven years, suddenly being told that you might be of more service at another position. That’s how a first baseman gets relocated. Upon reading that, I expected Marlon Brando’s “I Coulda Been a Contendah!” Nope. No moaning about finding work in Japan as a first baseman after the majors gave up on the converted hurler. Instead, Al Grunwald’s still filled with wonder! Grunwald’s only career save came as a Kansas City Athletic. He shut down the Boston Red Sox in Fenway Park on Sept. 11, 1959. How did that feel? 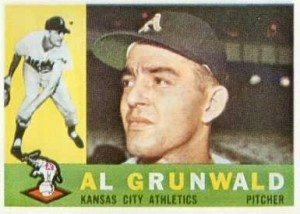 I hope more former players like Al Grunwald remain “as ever.” That would make a new year happier for all fans and collectors.